We offer a wide range of hotels near Luton Town from cheap accommodation to up market luxury hotels. Search our database of hotels to find the lowest rate for your stay closest to Kenilworth Road. In Luton town centre, this stylish hotel has free WiFi in public areas, boutique bedrooms and home-cooked food. Leaside Hotel is just 500 metres from Luton Railway Station, and offers free on-site parking. 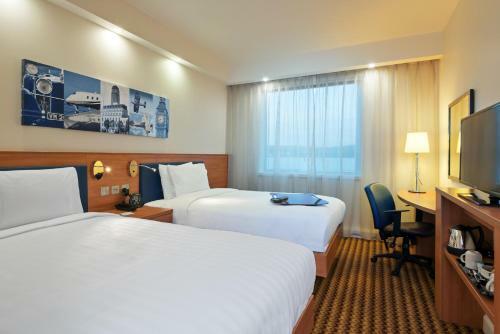 Situated 10 minutes’ walk from London Luton Airport terminal, Holiday Inn London Luton Airport offers a 24-hour bar, conference facilities, fitness centre and restaurant, plus en suite rooms with free Wi-Fi. With Wi-Fi in the lounge and a 24-hour front desk, Holiday Inn Express London Luton Airport is the closest hotel to Luton Airport Terminal Building, just a 10-minute walk away.